Global Team Power Points (GTPP) Not Team Finland's best submission. Yes, good Sir. Hell yes! Congrats for the record! Keep going AMD! - -230.0 (load) -235.0 (idle). It means LHe? @Steelrat, check youtube. Looks like liquid helium! Holy mother of god! AWSOME! How much do these chips hit with LN2 ? Probably close to 8, but not far over. Wow, that's epicness right there. Wonder how it stands up so sandy clock for clock though? were all 8 cores enabled? Looking good, for CPU-Z at least! 7 year and 8 months ago – wow! fking awsome work! finally nice cpu for benching) time to bench on -200! no cool bug in AMD CPU again !! ram is running CL7 ? Awesome ! Congrats AMD & benchers. this is crazy cpu! )) what is spi 1m frequency? What means the FX? F*** Xtreme? 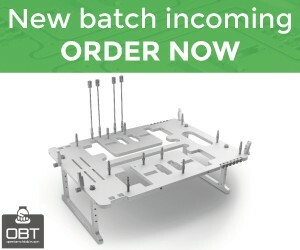 This is just F'n amazing; and on "non-final" units nonetheless; just imagine what the Rev3 units will be capable of... I see 9+ submissions in the near future for sure. And now we just wait and hope efficiency is at, or at least near that of SB. @TaPaKaH The odds were stacked against you my friend, but we want to make it right. Contact me and you will have your chance once again...on top of a BULLDOZER. We pay our dues. 01 on AMD anyone?! Massman you place a bet this time? Based on this and this I conlude scaling is linear (1.385x performance for 1.4x clock). With 8gig cpuz on ln2, maybe 7.65gig 01. Assuming similar IPC, that makes 136k. Maybe 130k. Now, based on this and this, we see no gain between 9800GX2 and GTX580. So 136K. My official guess is: "no, I will not guess this time"
Oh amazing...! nothing left to say! I was on hwbot for a few hours and than that!! thats no joke yeah ? extreme nice job, macci and amd! 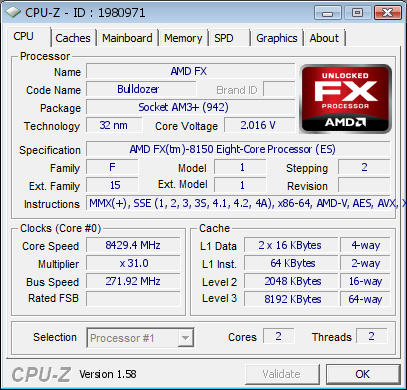 AMD finally nailed it, nice to see that those cpus have no cb. Any possibility of getting some superpi results there? if we started talking about "hwbot rules" - I don't think that unreleased hardware is allowed for points, no matter who's the bencher (OC or Pro PC) ... or am I wrong ? ... or who cares? Points are enabled to get the score on the frontpage. Macci already said he'd disable points for this when the score is no longer on the frontpage (after 24h). FWIW - about the points. Technically, if AMD says the hardware is 'released', anyone can have points for it. HWBOT does not give points to hardware that is under NDA. The hardware vendor decides whether or not hardware is under NDA. newspost on the frontpage isn't noticable? now we need an efficient 3D benching platform for globals, can we expect that? Congratulation, yeah FX is back !!! 7.9G 3D11 is expected with 8 cores ?! Absolutely amazing & proud of the result! I think they disabled all but two cores. very goood job guys und a nice score! Amazing. Simply amazing, LHe is some good stuff, and bulldozer seems have some serious horsepower under the hood. Netburst, Get out of here ~!! nice job, but why only 2 cores 2 threads? why not 8 cores? If it would be "released" there should be also scores in other benchmarks, so I think it is not "released" yet (or is it???) Where are all the ES-owners with their scores then? I am still wondering how AMD is able to not have results released early - not sure if I like it or not but business wise it should be good. Also I have big respect for having a business-structure that isn't "leaking"
amazing........ now i want 1 or "bunches" of these suckers... Bring Em On !!! Why does it say 2nd place when its 1st ?